What are fleas? What do they look like? 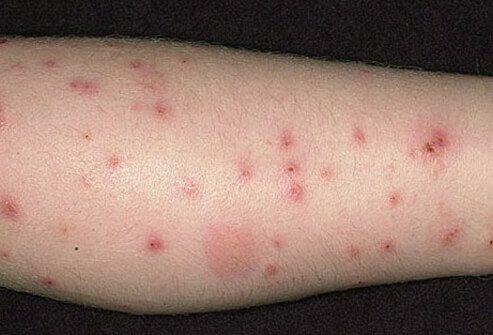 What does a flea bite look like on a person (pictures)? Flea bites in humans vs. bed bug bites, do they look the same? Do flea bites itch? Is it bad to scratch them? How can you to stop flea bites from itching? What are the signs and symptoms of a flea bites in humans? What are natural home remedies and other treatments are used for flea bites in humans? Can I become infected from flea bites? How can you prevent flea bites on humans? How can I tell if I have fleas in my home? 10 natural remedies and solutions get rid of fleas on pets and in homes? Do I have to have a pet to get flea bites? Fleas are a parasitic insect that feeds on the blood of mammals and birds. The most common flea species in the U.S. is the cat flea, Ctenocephalides felis. "Sand fleas" are not a type of flee. They are are tiny crustaceans, with a bite similar to that of the cat flea. Flea bites on humans look like small red spots that often occur in two to three groups or clusters with redness around them. Symptoms of allergic reactions to flea bites that are a medical emergency, and include difficulty breathing (shortness of breath or wheezing), swelling of the lips or tongue, dizziness, nausea, and chest pain. Infection from flea bites can occur because of scratching the bites. Fleas can transmit a number of diseases, including plague (Yersinia pestis), bartonellosis, typhus (Rickettsia typhi), tungiasis, and flea tapeworm. One of the first signs of a flea infestation in the home is when pets start scratching, biting, or licking themselves excessively. Fleas can also infest a home without pets. Flea bites can be treated with over-the-counter (OTC) anti-itch creams, lotions, or ointments. Wash the area first to keep infection from spreading and avoid scratching the bite. Home remedies to soothe or relieve itching from flea bites include ice packs, Aloe Vera, witch hazel, rubbing alcohol, vinegar, tea tree oil, and used tea bags. Prevent flea bites by keeping your pets and home free of fleas. Use flea preventive on your pets, and keep your home clean and vacuum pet areas regularly. It may be necessary to consult a pest control specialist to get rid of fleas. Can You Get the Bubonic Plague from Your Dog? Ask your vet about once-a-month flea medication, and put a monthly reminder on your calendar to avoid secondary infections from flea bites. Fleas are a parasitic insect that feeds on the blood of mammals and birds. There are an estimated 2,500 species of fleas in the world. The most common flea species in the U.S. is the cat flea, Ctenocephalides felis, which also infests dogs and can bite humans. Humans can be bitten by so-called "sand fleas," which usually are found at the beach and in coastal areas. They actually are not insects, but tiny crustaceans, though their bite is similar to that of the cat flea. They do not infest homes. Adult fleas are about 1/12 to 1/8 inch long, wingless, oval, flat from side to side, and dark reddish-brown. They have six long legs and can jump very high and far, about 200 times their body length. Flea larvae are pale white and measure about 3 mm in length, resembling tiny worms. The redness can last from a few hours to several days, depending on an individual's reaction, and how much (or little) the bites are scratched. Flea bites and bed bug bites appear similar, but they are not the same. Bed bug bites often look like mosquito bites. They can be red, firm, and there may be some slight swelling around the bite. Flea bites look like small clusters of red spots. Bed bug bites often appear in linear rows and can appear anywhere on the body, whereas flea bites tend to be located in clusters often on the feet and ankles. Bed bugs are nocturnal, and like to make their home in your mattress, so bites from these insects usually occur at night when you are sleeping. Fleas are also nocturnal but tend to cling to pets, and are found on furniture, drapery, and carpeting. Bed bug bites may take several days to appear and will start to itch gradually, whereas flea bites start to itch immediately and become swollen and red within an hour after the bite. Both flea bites and bed bug bites itch and can cause allergic reactions. The main symptom of flea bites is itching, which can be treated with over-the-counter (OTC) anti-itch creams, lotions, or ointments. Wash the area first to lessen the chances for infection. Apply an anti-itch topical medication such as calamine lotion (Caladryl), hydrocortisone (Cortaid, Cortizone), or diphenhydramine (Benadryl Itch Stopping Gel). If the itching is bothersome, an oral antihistamine such as diphenhydramine (Benadryl) may help. If you have an allergic reaction, see a doctor. You may be prescribed a stronger antihistamine such as hydroxyzine (Vistaril, Atarax). Allergic reactions to flea bites can be a medical emergency, so call 911 or get to a hospital's emergency department immediately. Wrap ice packs (or frozen vegetables) in a towel and apply to the skin to relieve swelling, and to numb the area. Witch hazel can help with itching. Rubbing alcohol can be used to dry the bites. White vinegar (dilute 1 part vinegar with 1 part water) can provide temporary relief. Tea tree oil to can relieve itching. Cool used teabags in the freezer and apply to the bite to relieve inflammation. Avoid scratching the flea bites because you can create an open wound that will let in bacteria, and can lead to infection. Infection and disease can result from flea bites. Infection usually occurs because of scratching the bites. Bacterial and other debris can be present under the fingernails, and if a person vigorously scratches a fleabite, they may cause the rash to become an open wound for bacteria to enter. Since most flea bites are due to fleas brought into the home by pets, the best way to prevent being bitten is to prevent the fleas from getting on your pets. Keep your pets away from animals you know have had fleas recently. Keep your pets out of difficult to treat places such as under decks or sheds. Mow your lawn frequently and keep the grass short. Use a flea comb to check your pet's fur for fleas. Keep pet bedding clean and wash in hot water. Vacuum carpets, rugs, and upholstered furniture frequently, especially in areas where pets sleep, and under beds, sofas and behind furniture. Dust furniture and dry clean curtains and upholstery. Use flea preventive medicine on your pet once a month (for example, Advantage, Advantix, Frontline, Revolution, Sentinel, and others). Talk to your veterinarian about the right product for your dog or cat. If you catch fleas on pets or in your home early it is much easier to get rid of them before they spread throughout your home. Avoid the beach in the early morning and late afternoon, when sand fleas feed. Use lounges or chairs rather than a towel or blanket on the sand. Wear closed shoes and socks when walking on the beach. Use insect repellant with DEET. Stay away from seaweed, a favorite food of sand fleas. One of the first ways people notice they have a flea infestation is when their dogs or cats start scratching, biting, or licking themselves excessively. You can use a flea comb to check your pet's fur for fleas and flea feces. Flea feces on your pet may look like dot-like insects or flecks of dirt or pepper. Once fleas have gotten onto pets it does not take long to spread through the household. Once they have infested the home, you may notice fleas hopping on your carpet, furniture, or drapery. If you suspect that your pet or home may have a flea infestation you can test the dark specks to see if it is flea feces. Moisten the suspected flea feces, and if it turns red or maroon in color, it is flea feces. (Flea feces is comprised of dried blood.) Another quick way to help you check for a flea infestation is to wear long white socks. Fleas like to jump on human's feet, ankles, and lower legs. The insects are dark reddish-brown, and if they jump on you while you wear white socks they will be easier to see. Getting rid of fleas is a multi-pronged approach.There are some natural solutions that may help repel fleas, however, if you have an infestation it is probably best to consult a pest-removal specialist to thoroughly rid your home of fleas, and consult your veterinarian to make sure your pets are flea-free. Once you have gotten rid of fleas, you can use some natural remedies to prevent them from returning. Treat areas of the home with antimicrobial solutions such as tea tree oil, garlic spray, or diatomaceous earth powder. A few drops of tea tree oil may be added to bath products, or it may be used as a spray on bedding, upholstery, carpets, and other fabrics. Essential oils can be used to make a homemade flea repellant spray. Common oils used include eucalyptus, peppermint, tea tree, rosewood, cedar, citrus, or lemongrass. Mix with water and put in a spray bottle. Use homemade flea traps to help get rid of fleas. In a bowl, add equal amounts of hot water and liquid hand soap, and place the bowl at the foot of your bed with a small lamp on nearby. The fleas are attracted to the warmth of the light and will fall into the trap and drown. Before you vacuum, sprinkle diatomaceous earth powder and Borax powder on carpets, rugs, and flooring. Borax can be irritating to the skin and eyes, so keep away from children. Eucalyptus trees are known to be flea-repellent, and can be planted in the yard. Flea bombs (foggers) do not soak into carpets well, where flea larvae live. Because of this, most pest control specialists do not recommend flea bombs because they do not consider them to be effective. Add small amounts of Brewer's yeast and apple cider vinegar to your pet's drinking water to help repel fleas. Diluted apple cider vinegar may also be used a final rinse for pets after bathing. Herbal shampoos to bathe your pet(s) include eucalyptus, lavender, germanium, lemon, or tea tree. Garlic added to your pet's food may help repel fleas. Talk to your vet about ways to keep your dogs and cats free from fleas. Before using any home or natural flea preventive/repellant remedy on your pets, consult with your vet. Some remedies work well for some pets and not others, and some pets may have unwanted reactions to these items. The amount of any herb or oil or other product used for a pet may vary depending on their size, weight, age, breed, and overall health. It is always best to consult with your veterinarian to make sure the products and amounts you use are safe for your cats and dogs. While most home flea infestations occur in homes with pets, fleas can infest home without pets as well. This may happen in several scenarios. If you recently moved into a home where previous owners had pets with fleas, and they were not properly eradicated, you may find yourself with a flea infestation. Used furniture may come infested with fleas. Pests such as rats or mice, or wild animals such as opossums, raccoons, squirrels, and skunks also can carry fleas and bring them into your home. What public places may have fleas? A common public place where fleas may be found is in dog parks. They also may be found in large natural parks that are home to wild animals such as opossums, raccoons, squirrels, and skunks that can carry fleas. Ogg, Barb, PhD. "Integrated Flea Control." University of Nebraska-Lincoln. Entomology Department at Purdue University . "Fleas." Castells, MC, MD, PhD. "Insect bites." UpToDate. Updated: Kim 01, 2017. Michigan State University Pesticide Safety Education Program. "Questions and Answers About Fleas." National Park Service US Department of the Interior. "Office of Public Health - Flea Factsheet." Fleabites.net "Flea Bites on Humans - Pictures, Treatment and Prevention." 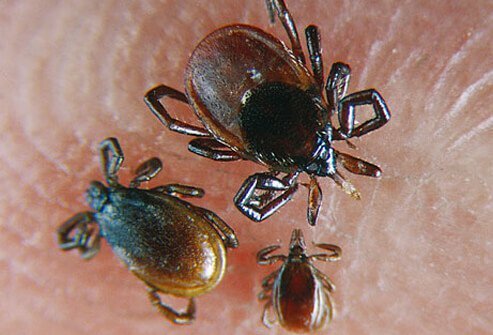 Bedbugs (from the insect family Cimicidae) are small, reddish-brown tick-like insects that feed by sucking the blood of mammals. They are often found in poorly sanitized areas or in crowded living quarters. Cat scratch disease (CSD or cat scratch fever), a bacterial disease caused by Bartonella henselae, is characterized by fever, headache, fatigue, poor appetite, swelling of the lymph nodes, and mild infection at the site of the bite or scratch. Cats that carry B. henselae don't show signs of illness. Approximately 40% of cats carry the bacteria at some point in their lives. What works for a wound, and what's a myth? Test your first aid knowledge about how to care for scrapes, cuts, and burns and discover the myths about cleaning and covering injuries that may be preventing faster healing. Some people are very sensitive to flea bites -- but scratching can cause a wound or infection. See a picture of Flea Bites and learn more about the health topic. Plague is an infectious disease caused by the bacteria Yersinia pestis. Transmission to humans occurs via fleas that have bitten infected rodents. There are three forms of plague that infect humans: bubonic, septicemic, and pneumonic. Antibiotics are the standard treatment for plague. Do you really know about puppies and dogs? Learn the ropes or get a refresher course with the Puppies and Dogs Quiz.